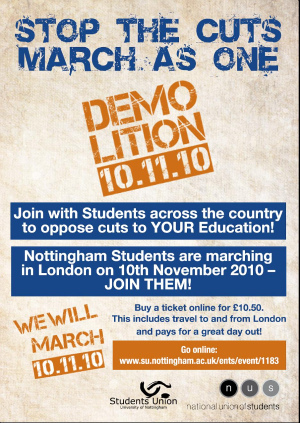 The UCU (Universities and College Union) and NUS (National Union of Students) are jointly organising a national demo, ‘Fund Our Future: Stop Education Cuts’ on Wednesday 10 November 2010, in central London. Nottingham Trent University and University of Nottingham UCU will have a coaches running for members and non-members who want to attend the demonstration (contact local unions for information). The NUS at University of Nottingham will also be running coaches. This entry was posted in Events & meetings, Road to success and tagged demonstration, education, london. Bookmark the permalink.